You already know how to plot data in simple charts and how to edit that data in the associated Microsoft Excel worksheet. Often, you will need nothing more than these basic techniques to be able to convey your numeric data in a visual format. However, for those times when you need more than a basic chart, PowerPoint provides formatting capabilities that enable you to produce just the effect you want. Column charts . Used to show how values change over time. Bar charts . Used to show the values of several items at one point in time. Line graphs . Used to show erratic changes in values over time. Pie charts . Used to show how parts relate to the whole. Format individual elements such as titles, axes, data labels, and gridlines. Add trend lines, bars, and other lines. Customize the walls and floor or otherwise manipulate a three-dimensional chart. Customize the look of shapes. Add and format fancy text (WordArt). Precisely control the overall size of the chart. You can double-click almost any chart object to change its attributes. For example, you can double-click an axis to display the Format Axis dialog box, where you can change the scale, tick marks, label position, line style, and other aspects of the axis. 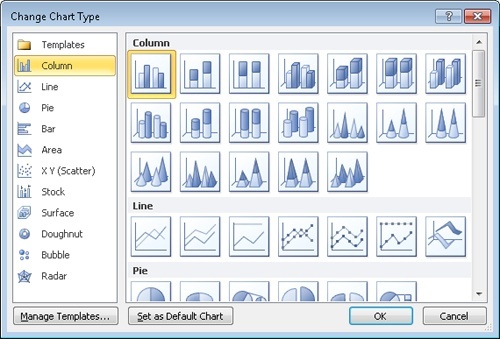 If you have trouble double-clicking some of the smaller chart elements, you can select the element you want to format from the Chart Elements list in the Current Selection group on the Format tab, and then click the Format Selection button in the same group to display the Format dialog box for the selection. If you make extensive modifications, you might want to save the customized chart as a template so that you can use it for plotting similar data in the future without having to repeat all the changes. In this exercise, you’ll modify the appearance of a chart by changing its chart type and style. You’ll change the color of the plot area and the color of two data series. You’ll then hide gridlines and change the layout to display titles and a datasheet. After adding an annotation in a text box, you’ll save the chart as a template. 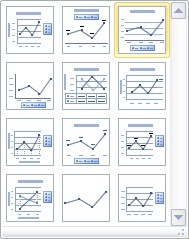 Display slide 14, and click the blank area above the chart legend to activate the chart without selecting any of its elements. Be sure to click a blank area inside the chart frame. Clicking any of its elements will activate that element, not the chart as a whole. PowerPoint displays the Design, Layout, and Format contextual tabs. On the Design contextual tab, in the Type group, click the Change Chart Type button. Each chart category provides several different design options. In the gallery on the right, under Line, double-click the fourth thumbnail (Line with Markers). 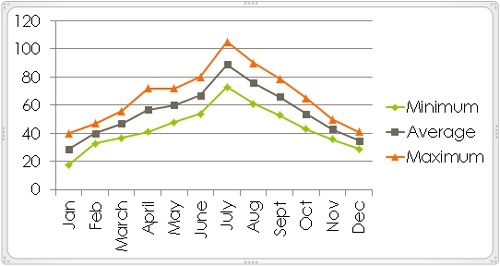 The column chart changes to a line chart, which depicts data by using colored lines instead of columns. The temperature data plotted as a line chart. In the Chart Styles group, click the More button. The Chart Styles gallery appears. You can quickly switch to a different color scheme or data marker style. In the gallery, click the last thumbnail in the fourth row (Style 32). The lines are now thicker, and the data markers are three-dimensional. Move the pointer over the chart, and when a ScreenTip indicates you are pointing to the plot area, click to select it. The plot area is the area between the axes that contains the data markers. On the Format contextual tab, in the Shape Styles group, click the Shape Fill arrow, and then in the list, click More Fill Colors. When none of the theme or standard colors meets your needs, you can pick a color in the Colors dialog box. On the Standard page, click the pale yellow below and to the left of the center, and then click OK. The plot area is now a pale yellow shade to distinguish it from the rest of the chart. To change several aspects of the plot area, right-click the area and then click Format Plot Area to open the Format Plot Area dialog box. You can then change the fill, border, shadow, and 3-D format in one location. At the top of the Current Selection group, click the Chart Elements arrow, and then in the list, click Series "Maximum". If you have trouble selecting an element of the chart by clicking it, you can choose it from the Chart Elements list. An outline appears around the data points of the selected series. In the Current Selection group, click the Format Selection button. The Format Data Series dialog box opens. You can change several aspects of the selected data series in this dialog box. 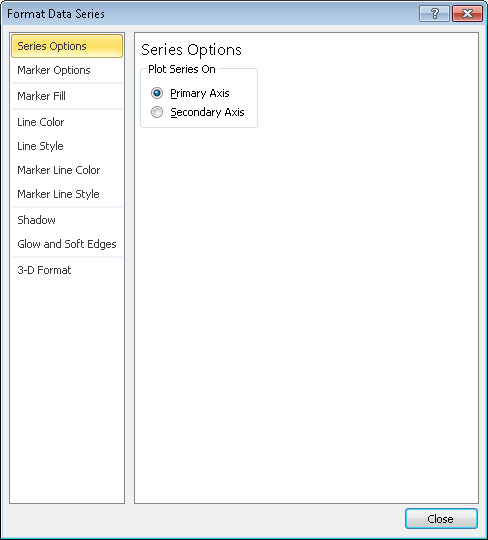 In the left pane, click Marker Fill, and on the Marker Fill page, click Solid Fill. 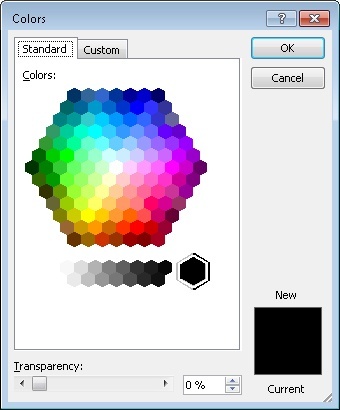 In the Fill Color area, click the Color button, and under Standard Colors, click the first box (Dark Red). In the left pane, click Line Color. Then on the Line Color page, click Solid line, and change the color to the same dark red. Repeat step 12 for the marker line color, and then click Close. The Maximum data series is now represented by the dark red color. On the Layout tab, in the Axes group, click the Gridlines button, point to Primary Horizontal Gridlines, and then click None to remove the horizontal gridlines from the chart. On the Design contextual tab, in the Chart Layouts group, click the More button. The Chart Layouts gallery appears. You can quickly change the layout of the chart by selecting one of the predefined options. In the gallery, click the first thumbnail in the second row (Layout 4). The legend now appears below the chart. The plot area has expanded to occupy the area vacated by the legend. When you don’t have a lot of data, choosing a layout that includes a datasheet—a table with all the values plotted in the chart—can clarify without adding clutter. In this case, we have too much data to add a datasheet. On the Layout contextual tab, in the Insert group, click the Text Box button. 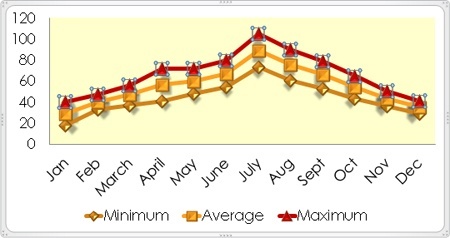 Point below the chart title and above the July maximum temperature, and then drag diagonally down and to the right until the text box stretches as far as the December data. 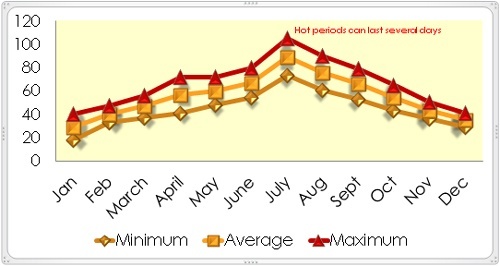 Type Hot periods can last several days. Then select the text, and on the Home tab, in the Font group, change the size to 10 points and the color to Red. Click a blank area within the chart frame to release the text box selection. You can now see the results. On the Design contextual tab, in the Type group, click the Save As Template button. The Save Chart Template dialog box opens and displays the contents of your Charts folder, which is a subfolder of your Templates folder. If the Charts folder does not appear in the Address bar, navigate to the AppData\Roaming\Microsoft\Templates\Charts folder under your user profile. 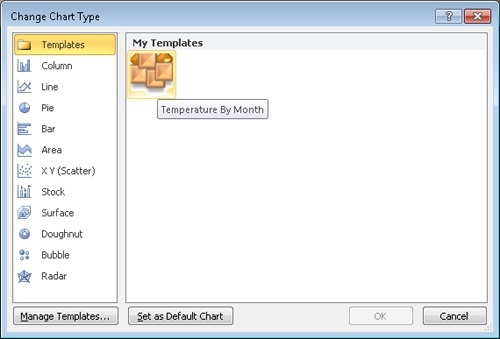 With the Charts folder displayed in the Address bar, type Temperature By Month in the File name box, and then click Save. In the Type group, click the Change Chart Type button, and then in the left pane of the Change Chart Type dialog box, click Templates. Then point to the icon under My Templates in the left pane. A ScreenTip identifies this template as the one you just created. In the future, you can click the custom template to create a chart with the same layout and formatting. To delete a custom chart template, click Manage Templates in the lower-left corner of the Change Chart Type dialog box, and then when Windows Explorer opens with your Charts folder displayed, right-click the template and click Delete. Confirm that you want to delete the template by clicking Yes, close Windows Explorer, and then close the Change Chart Type dialog box. If you don’t want to keep the chart template, delete it by following the directions in the preceding tip. Then save and close the LandscapingChart presentation.